Our annual Senior Banquet is coming up soon. It’s a milestone…a rite of passage. We invite graduating seniors and their immediate families to a nice dinner free of charge. We celebrate their stories, their successes, and their promise-filled futures. We laugh together. We cry together. We pray together. This year, for their gift, we’re creating an inspirational framed poster with the three most significant principles we want our students to walk away with embedded in their lives. When it’s all said and done and they’ve graduated from our high school ministry, if nothing else we want them to walk away embracing these three words: GRACE, IDENTITY, MISSION. I’d love to hear what you think. It’s still a work in progress. Feel free to comment. GRACE: God extends grace to me. I will extend grace to others. We want our students to really grasp the magnitude of grace God has extended to them for their redemption. Then, because of that amazing grace, they too must extend extravagant grace to others around them. As fallen people redeemed by the grace of God our default interaction with the people around us should not be one of judgment, ridicule, and criticism of their sins and short-comings. Rather, our interactions should be motivated by grace and compassion. For it is grace, not righteousness, that overcomes sin. IDENTITY: God has given me a new identity. I will not search for it elsewhere. We want our students to embrace their true identity in Christ. We want them to really understand that the source of their identity is in Christ. It is not in their achievements, failures, relationships, reputation, sexuality or anything else. Embracing their identity in Christ will strengthen their confidence, increase their resilience, broaden their perspective, stabilize their relationships, and deepen their self-understanding. MISSION: God appeals to the world through me. I will be his ambassador. We want our students see the bigger picture of God’s mission in the world and to join his mission of reconciling the world back to himself. They do not exist for their own pleasure. Their purpose in life is not to fulfill their own dreams and goals. Rather, it is to glorify God by joining in His mission as Ambassadors of Christ to redeem the world and to restore it to its’ original relationship with God. All other goals, aspirations, even questions about direction and God’s will, fall subservient to the primary objective of God’s mission. 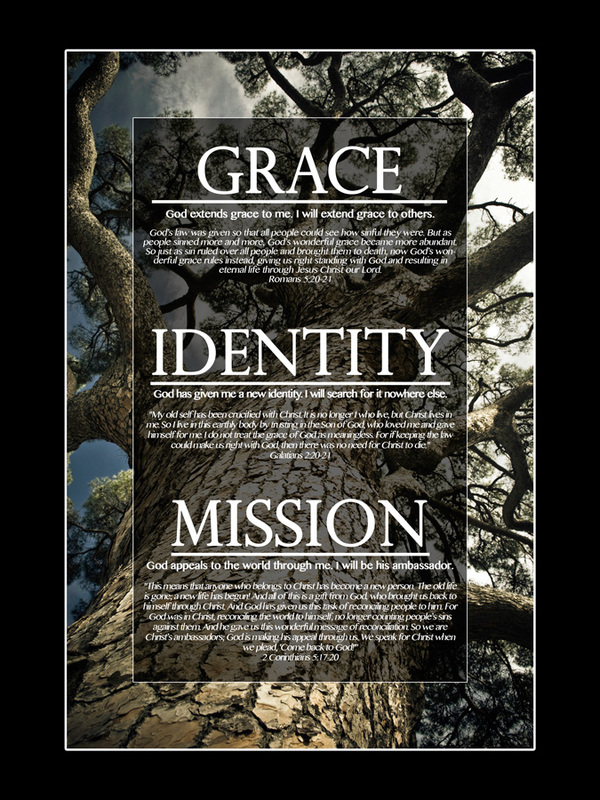 These three principles serve as the core (the trunk) of the tree of life and faith from which all other aspects of character, maturity, choices, and relationships stem. We cannot expect our students to grow the branches and fruit of righteousness and maturity until we have cultivated within them these three principles. If nothing else…Grace, Identity, Mission.